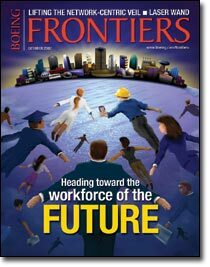 I found your article on the 21st Century Worforce (October 2002) interesting for its coverage of the wide range of future workforce requirements envisioned. One of my colleagues pointed out the story and had some questions about the "Echo Chart" on page 19 (print edition), showing the correlation of the 12 scores that make up the [Boeing] Employee Satisfaction Index (ESI). The initial question on the validity of the chart came from the pay score relative to the ESI. Essentially, the higher a certain metric's correlation score, as shown on the Echo Chart, the more likely ESI is to be sensitive to changes in that metric. For example, if an employee rates his or her "Involvement in decisions" score as positive, he or she is more likely to generate a higher individual satisfaction index (meaning he or she is more likely to have rated the other questions as positive also). This explains the high correlation score of "Involvement" on the chart shown. The reason "Pay" returns a low score on the Echo Chart is that the ESI appears to be less sensitive to fluctuations in the "Pay" score. Employees happy with their compensation can be unhappy with all the other metrics. This does not mean that compensation isn't a serious issue affecting employee satisfaction, as some may assume by a quick glance at the chart. The important thing to remember is that all 12 questions, including "Pay," do have an effect on the ESI score, since the ESI is a simple average of the 12 items. If the "Pay" positive response is increased, and the other scores remain constant, then the ESI will go up.  James Manlove, Everett, Wash. The "office" as we know it is going to change, and it is changing as we speak. No longer do you see a typewriter. When was the last time you saw someone smoking in the workplace? Open-mindedness, mobility, virtual office space and global participation are concepts that we are going to see more and more. "You can do anything" is the mantra of the new talent that is coming into the work environment. Our workforce will be high-energy and have high visibility like never before. We will have more control of our lives and our work like never before. I'm glad I can be part of Boeing as it more moves toward the changing workforce, climate and world.  Jayson Morris, Madison, Ala. The workforce of the future will recognize that job security and compensation are proportional to the market's demand for their specific skills. It will also recognize the demands of the marketplace continuously evolve. (When was the last time you took shoes to a cobbler?) Certainly some skills, such as effective communication, are always needed. The demand for other skills, such as mathematics or machining, change more slowly. But the demand for many skills can emerge or vanish quickly. An example at Boeing: The demand for tool-building skills has fallen dramatically in the last few years. This was caused primarily by the emergence of measurement technologies and assembly methodologies that reduced the need for physical gauges and assembly tooling. This trend has allowed Boeing to produce higher-quality products at a lower cost, requiring fewer tooling people. Simultaneously, the market began demanding more people with computing skills (Web authoring, database management, etc.). Many people with tooling skills saw the market demands changing early enough to seek training and launch new careers in an area where market demand existed. Some didn't and are less employable as a result. And that is a problem that the employer of the future can help solve. Thankfully, Boeing currently provides outstanding training opportunities for its employees, and Boeing employees are the best-trained people in our industry. The next step is to ensure that our strategic sourcing plans anticipate the skills that will help us reap the greatest profits in the future. Then we can link employee training to our strategic plans, and help develop the employees of the future.  Tom Greenwood, Wichita, Kan.
With the concern of stolen identities so prevalent today, I would like to see the Matching Gift form revised so we don't have to give out our entire Social Security numbers. These forms are sent to a diverse population with many of the recipients using volunteer help, some of whom may not be aware of confidentiality precautions. Perhaps selective identifiers could be used rather than the entire number.  Helen Askew, Everett, Wash. Cheers for the Boeing Fire Dept. We are very fortunate to have the Boeing Fire Dept. On July 16th my daughter Jazzlyn fell at a Boeing daycare center. The day care center and the firefighters worked together to identify the injury and transport her to the hospital. At the time, I was at an appointment in downtown Seattle with my husband. We were contacted with each decision. One of the Boeing firemen got on the gurney and held her until they arrived at the hospital. My daughter's injury was a broken elbow. At 22 months old it required two surgeries to fix. All of the individuals involved handled the situation with great skill and as if it were their own child. I was thrilled to learn that in an emergency like an earthquake the Boeing Firemen go to the daycare first.  Tiffany Rowland, Seattle, Wash. Your October issue "By the Numbers" feature says the average person blinks 20 billion times a year. That is 634 times a second. Best I could do was about 5 times a second. I think you have a few too many zeros.  Martin J. Banel, Renton, Wash.
Editor's note: The reader is correct. The number should have been 20 million. I have worked for Boeing for five years now. There are seven children in my family and many of them have worked there as well. My mother retired from Boeing after 28 years. The company has supported my family and many other families for years. I have a hard time listening to the employees who have complained about the way the company is handling the new environment that was forced upon it since the Sept. 11 terrorist attacks. Boeing would not let people go without a good reason. If the company were doing well they would hire more people. But when it's time to reorganize and make the adjustments to stay completive they must let people go. And they must find the least expensive way to build airplanes. Why do people take it personally? Yes, it is an incredible blow to be told that you no longer have a job, but you cannot keep people employed because you feel sorry for them. There are too many people here who forget what the company does do for thousands of people. It's time to start remembering.  Jo Nettleton, Renton, Wash.
New badge does it all … or does it? We've got a new badge with smart chip, proximity antenna, proximity number, bar code, mag strip, clearance decal, export status, picture, nickname, legal name, return address, BEMS ID, Boeing logo, badge date  and a slot at the top to hang it from. With all that fancy engineering one would think that Boeing would have added the most important and commonly used feature of the badge … an ice scraper.  Paul Crandall, Everett, Wash.
Boeing Frontiers Boeing Frontiers provides the letters page for readers to state their opinions. The page is intended to encourage an exchange of ideas and information that stimulates dialogue on issues or events in the company or the aerospace industry. The opinions may not necessarily reflect those of The Boeing Company. Letters must include name, organization and a telephone number for verification purposes. Frontiers may edit letters for grammar, syntax and size. We on the Pelican program are appreciative of the coverage provided by the September issue of Frontiers on our advanced cargo aircraft concept. This story has kicked off a large response by worldwide media, for which we are grateful. You published three letters in the October Frontiers that indicate a measure of confusion about the concept. We are hopeful that this brief response will clear up some of that confusion. 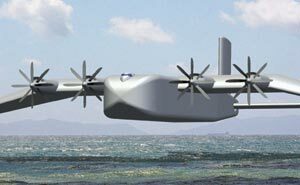 Other than cruising at low altitude above water, the Pelican has little in common with historical Russian wing-in-ground-effect (WIG) aircraft. The Russian WIGs were designed primarily for short range, sea-based military missions. With beefy structure and ample propulsion systems for water operations, they were no more efficient than modern subsonic transports, despite their lower speed. The advent of computer-based flight controls permits the Pelican to be land-based, so that it can be much lighter and aerodynamically cleaner than earlier WIGs. It appears, remarkably, that land-based WIGs differ little from aircraft optimized for conventional cruising altitudes. This permits a dual-mode aircraft to provide substantial operational benefits in the long-range transport of cargo. Advanced flight control systems also provide ample maneuverability while automatically maintaining safe clearance from the water.  Blaine K. Rawdon, Pelican Program Manager, San Pedro, Calif. The next Boeing Frontiers will be a double issue, combining the months of December and January into a single issue. Typically, Frontiers comes out on the first Friday of every month. For the December/January issue, it will come out one week later and be available Dec. 13. Because of the combined issue, the first Frontiers to be distributed in 2003 will be the February issue, which will hit the newsstands on Feb. 7.